A few days ago, I made one of my rare trips to Amsterdam again and one of my stops is always the small Marks & Spencer store in the Kalverstraat. I like trying out new things, especially with regards to food, and I seem to discover something new every time I am there. This time, I found out that they changed the packaging of their potato crisps (I am not sure if they changed the flavors too). Then, I remembered that I have forgot to review the potato crisps that I bought together with the Marks & Spencer Hand Cooked Lemon Harissa potato crisps, which is a long time ago already. I don't know if this will still be useful, but for reference's sake, I will shortly give you my thoughts of the three kinds of crisps that I also tried from Marks and Spencer. 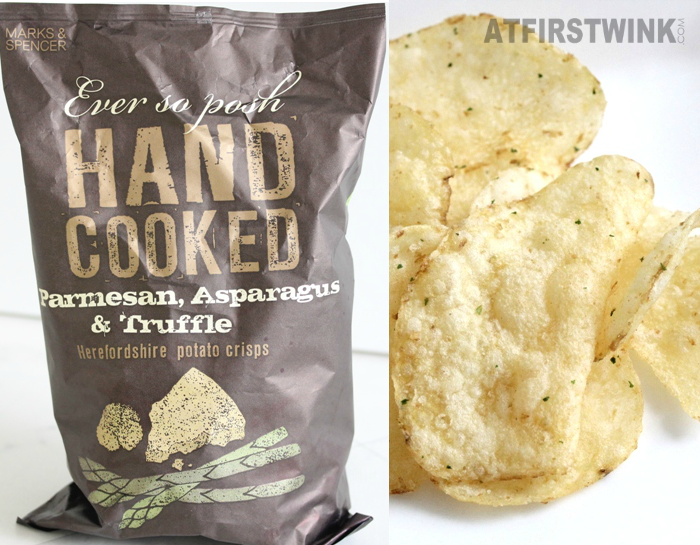 The truffle flavor in the parmesan, asparagus & truffle crisps (150g) is quite distinguishable, as it naturally has a strong taste. The parsley flavor isn't as strong as in the lobster cocktail crisps (review of that underneath), which is good as I prefer a subtle parsley flavor. Maybe, some of the small green herbs on the crisps could be asparagus instead of parsley, but I couldn't really taste it. You can also barely taste the parmesan, as it is very lightly coated with a cheese flavor. In this bag (100 gr), you can find lightly salted mixed parsnip, sweet potato, and beetroot crisps cooked in sunflower oil and seasoned with sea salt. If you are like me and don't eat these vegetables a lot, this piece of information might help you: parsnip (light yellow piece), sweet potato (orange piece), and beetroot (red/purple piece). 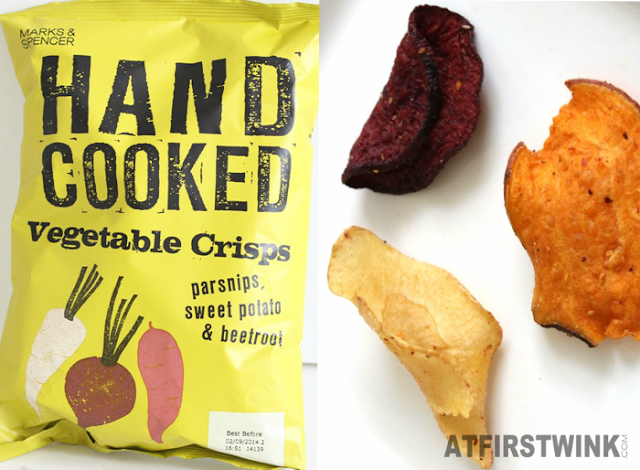 The flavor of these vegetable crisps is not what I expected, as I have eaten some very good vegetable chips before. The crisps are quite hard and folded/rolled in a small piece. They also have a strange soil like flavor. I think that this could be the reason why some people don’t like to eat vegetables. Even for someone like me that just love eating almost every vegetable, I couldn’t finish the bag. 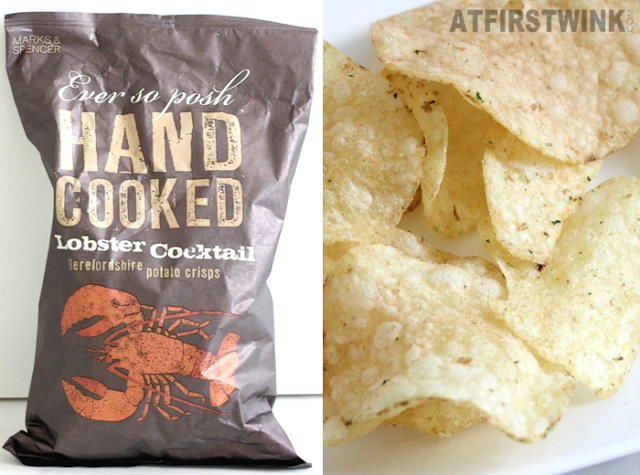 The Lobster cocktail potato crisps (150 g) looked so similar to the parmesan, asparagus & truffle crisps that I couldn't tell the two apart in the pictures that I had taken. But in the end, I found out that these crisps have a slight orange powder on them (like the crisp on the very top) and less green herbs. You really need to slowly chew and taste it, to get a bit of an aftertaste that has a slightly fishy cocktail sauce flavor. I can’t really taste the lobster. I think the lobster flavored corn sticks that I ate in Hong Kong before are a lot more delicious. When you eat the crisps very fast, you mainly taste the parsley and a bit of the garlic, parsley, onion, tomato, paprika powder mix. One or two out of ten crisps are heavily flavored and the rest barely have any taste. I think they didn't mix the seasoning too well or they did this to try to get maximum taste with less salt and/or seasoning. Overall, they are very lightly flavored crisps. The good thing to that is that you won't get sick of it after a few handfuls. The crisps are a bit harder than normal crisps, but the thinness of the slices is pretty similar. I do taste the potato flavor a bit more than in the crisps that I normally eat. It is also good that there are no artificial colours, artificial flavourings, or added MSG. But I am not sure if I want to try these crisps again (even with possibly improved flavors). I think I should stick to the normal flavors instead.